Thank you for purchasing the AgeMeter. We are excited to share this amazing piece of technology with you. In this guide we will walk you through the essentials of operating and managing the AgeMeter test and it's hardware. If you have additional questions, you can always reach our support team at support@agemeter.com. Each hardware device has been fully charged prior to shipment, however occasionally these may lose charge during transit. To ensure you are starting with full charge, plug in each device for a minimum of 3 hours prior to use. The Apple iPad has a specific firewire cable that works exclusively with that device. The pulse oximeter, haptic vibrometer, and spirometer all use USB 2.0. One USB 2.0 cord and charging station is included with your kit. If you have a USB 2.0 charger already, this may be used as well. Prior to beginning a test, ensure that all of the equipment is charged and within arm's reach of the iPad. These will be needed in order to complete the AgeMeter test. The spirometer, pulse oximeter, and vibrometer utilize wireless Bluetooth technology and do not need to be plugged into the iPad. These will automatically connect when powered on during the test. Ensure that you do not turn off Bluetooth capabilities on the iPad. The earphones should be plugged directly into the iPad. Turn on the iPad. No login credentials will be required at initial power on - however can be adjusted in the Apple Settings application. 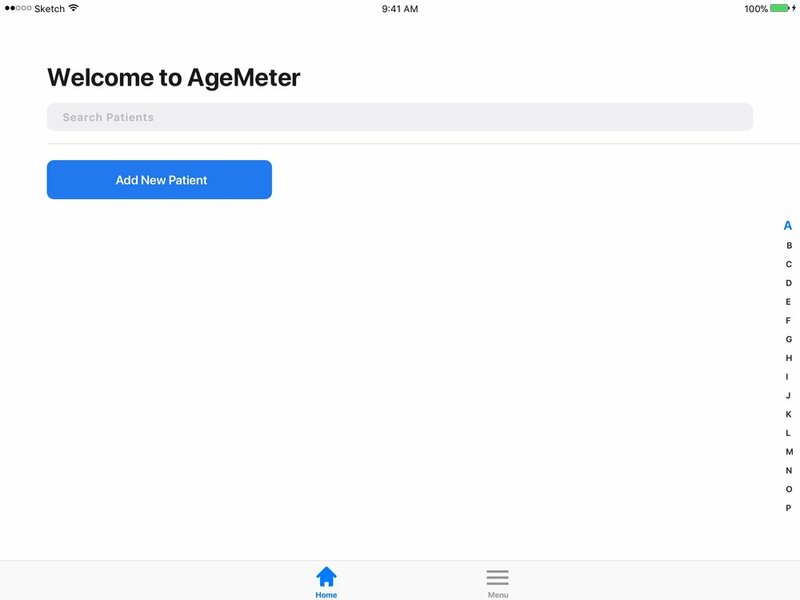 Login to the AgeMeter test utilizing the email & passcode credentials provided to you by AgeMeter. If you did not receive a confirmation email with login credentials, tap "Create New Account" and follow the instruction on the screen. After you create your profile, tap "Return to Log in" to login to your profile. After logging in, you'll arrive at the Home View. From the this screen, you'll be able to add new patients and view all past patients added. It is from this screen where you'll also begin new tests for patients. To add a new patient, tap the blue "Add New Patient" button on the screen. 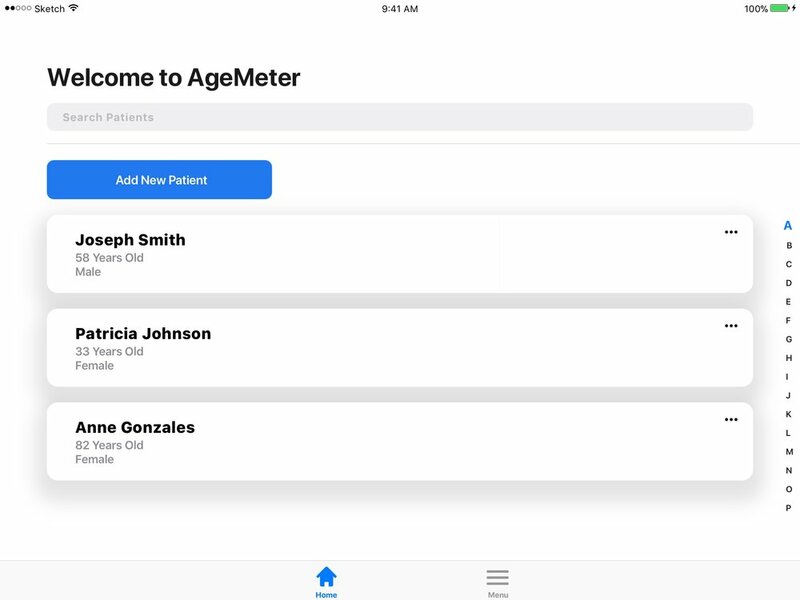 When you tap the "Add New Patient" button, you'll be able to enter in all of the patient's information who will be taking the test. Attributes such as weight and height are utilized to help calculate estimated functional age. You can access the Settings view by tapping the "Settings" icon on the bottom of the page. To begin a test, simply tap on the desired patient's profile cell. This will automatically begin the guided test. Be sure that all of the hardware (listed above) is within arm's reach, the volume is turned up all the way, and that the headphones are plugged directly into the iPad. Instruct the user to place the headphones for the entirety of the test. 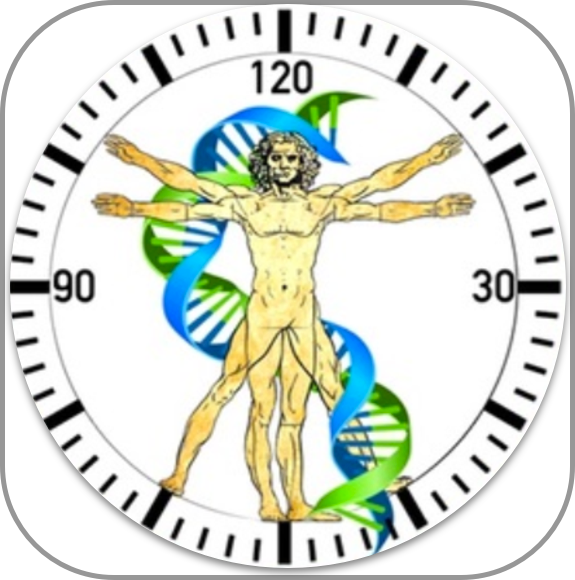 The AgeMeter test is designed be fully self-guided by the user taking the test. A combination of text and video help instruct the user on exactly what to do. Oversight during the test is not required; however, in the event questions do arise, ensure the user knows how to locate you prior to beginning the test. Forward/Back: As previously stated, a user will be automatically guided through each test. However, a user may navigate forward or backward at will by tapping the arrows in the upper right-hand of the screen. This allows a user to replay an information video for a test, or skip a test entirely. Be certain to instruct the user accordingly (for example, if you would like them to take all tests, indicate to do so). Exit: At any point during the test, you may exit back to the Home View by tapping the "X" in the upper left of the screen. After tapping the "X", you must enter your administrative passcode used to login to AgeMeter. This ensure patients do not access other patient information. 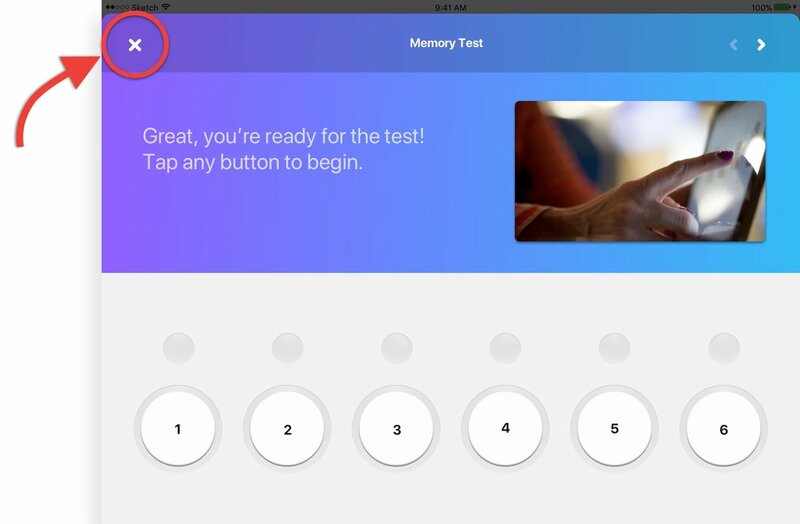 After exiting, you may continue taking the test where it left off by tapping the bar on the bottom of the home view labeled "Continue [current test] for [patient name]". At the conclusion of the test, the individual test results will display. The results include the estimated functional age of the patient, along with the individualized scores for each test and how that user compares to their chronological age peers (by percentile). Sharing Results: You can save and share the test results by tapping the blue share icon in the upper right of the screen. You be given several options as to how you would like to share/save the results. In order to use the email function, you must setup your email on the iPad using the iOS system setup (see https://support.apple.com/en-us/HT201320).